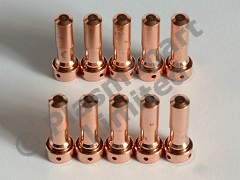 PT 23 / 27 consumables suitable for use with the PT 23 / 27 torches, which are used on many Chinese plasma cutters. The electrodes are turned copper with hafnium cores. This pack is supplied as shown, and contains 10 electrodes. Model 33366.